I am looking at purchasing a 2003 GL 1800 with 90K miles. I personally believe it is just broken in well... My friends are telling me the milage is too high and I should keep looking. Any advice??? If you look around, you can find something with lower mileage. That being said, that equals about 6,000 miles a year and as long as the maintenance has been kept up, and the bike's visually in good shape, why not. What kind of price are they asking? Do they have the maintenance records? Is it ride ready right now, or would it need some work before you head out on the road? Good luck and ride safe. It looks near perfect. It has a few scratches around the ignition which are obviously from the keys. It is at a dealer so not sure about maintenance records. However it is smoooooth and everything works. Test rode it yesterday. They are asking $6999 which I may be able to negotiate. Just looking to perhaps move up to something newer than my '88 GL 1500. Private sale in NY last year - 2003 with 34K, $6,500. That's what I paid for my 03 with 64,000 miles on the clock. With that many miles, if they'll drop the price, I'd still go for it. If they won't budge, I'd take another look around. There are plenty of deals out there, just a matter of finding one close to you. Good luck. Where are you located? You might consider checking the classifieds on the different GW forums. There are a number of 1800's for sale right now, one I found was a 2007 for $7000. Something to consider. I would be more concerned about owner add-ons than mileage. When an owner adds items to the bike, they have a tendency to do shoddy work. If there is a lot of added lighting I'd look closely at the workmanship. Open up access areas and look for scotch-lock type of connectors and wire routing. They can be a real source of headaches. And a rats nest of wiring is always troubling. Also, have the dealer run the VIN to make sure that all the recalls have been done. Frame inspection/welds, ECM replacement, Cooling system flushing, Brake system parts replacement and flushing to name a few. 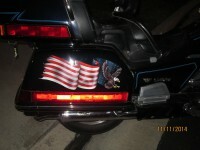 The wings are good bikes and most owners say at 100,000 miles they are just betting broke in. BUT, there are other things to worry about than the motor. Fork seals, alternator, final drive, stick switches and make sure all the recalls and service bulletins have been performed, and there are several of them, including and not limited to the frame re weld.Google gl1800 recalls. I wouldn't pay over $5000 for a bike with that many miles on it. check craigslist and cycletrader in your area. I purchased my 2002 from Honda of Russellville, AR with 97,750 miles on the odometer. and I too considered the bike to just barely be broken in. it now has 114,000 miles and runs like a top, fresh off the showroom floor. 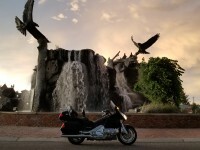 there are many documented cases of the Goldwings going to 500,000 miles. I know of one that has over 1 million miles on it. it is all about proper maintenance, they are slow speed, water cooled engines. for me, I was lucky to get the name/address of the prior owner. it was a 1 owner bike, and he sent me all of his documentation. Farkles? do not add $1 to the value, they are only for the ego of the person who bought them. My bike had ~$4,000 of Kury chrome on it, and I removed most of it.